OutRyders, New England's largest gay ski/snowboard club, is all about great friends, great on-mountain fun, and great times together at social events. The cost for a season's OutRyder membership is $35. The OutRyder club is a non-profit, all volunteer organization - membership fees are used for member parties, raffle prizes and any other fun thing we can think of. Members can order an OutRyder tee shirt for $20.00 while supplies last and OutRyders get great prices on lodging and lift tickets - love those group rates! As an OutRyder member you'll be a part of a growing club with over 200 members. Please read on to see what you can expect. As a new OutRyder you will meet some of the friendliest people on the planet. 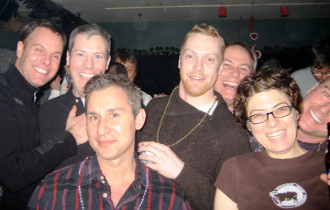 Every season lots of new members join for the great opportunities to connect with other gay skiers and snowboarders in small on-mountain groups, at huge parties, and at fun social events. As a member, you can communicate with other OutRyders in our online fORum and you’ll be kept informed of upcoming events via email and on the website. We do everything we can to make connecting easy. 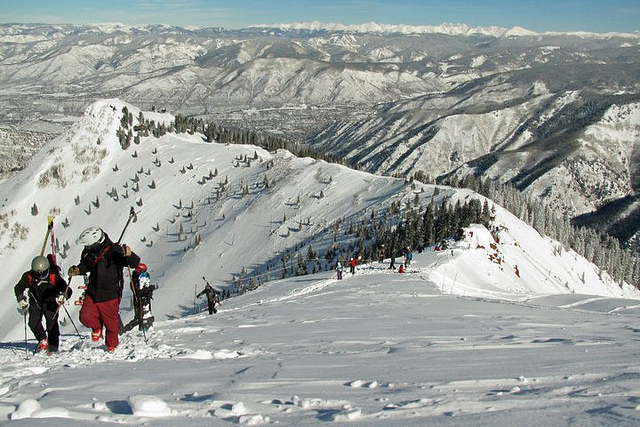 From newbies to experts, OutRyder skiers and snowboarders have a blast on the slopes. With over 200 members you will always find buddies at your level to ryde and ski with. At our morning meetups we split up into groups of people who enjoy the same level of skiing and ryding. Groups are led by friendly, volunteer mountain guides that know the terrain cold. We get back together for lunch in a cozy lodge. And, of course, we meetup at the end of the day to cap it off with apres cheer. Throughout the winter season, our expert Social Coordinators keep us busy with crazy fun off-mountain events. Plan on coming to the OutRyder Opening Party for a great start to the season. Meetup on the third thursday of every month at Cathedral Station for a casual get together. Warm your cockles at the Holiday Party. Show your athletic prowess on Bowling Nite. But most of all, come to the OutRyders social events just to hang with friends. As the official sponsor for many gay ski weekends, the OutRyder club can negotiate the best discounts available on lodging and lift tix. For day trips, our members get the group discount on lift tix for substantial savings. So, coming to just one or two mountain trips can cover the cost of your membership!